Welcome to the second installment of Star + Wars = Math, a series of Star Wars word problems I made up for my son, Liam. Today, we have Boba’s Choice, an adventure in bounty hunting! Dengar has failed Jabba the Hutt for the last time. Jabba hires Boba Fett to bring the bumbling bounty hunter to him, preferably alive, so he can enjoy feeding him to the Rancor. Jabba will pay Fett 500 credits for capturing Dengar alive, but only 250 credits for bringing him back dead. 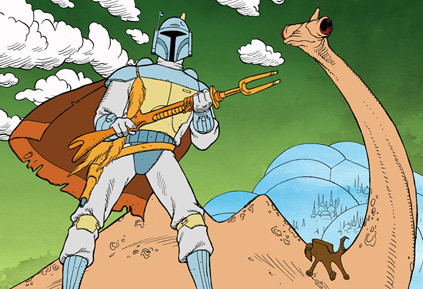 Fett discovers that Dengar is currently on Cloud City, surrounded by friends. He knows that the only way to finish the job on Cloud City would be to kill Dengar. But Fett also knows that Dengar is leaving Cloud City soon and his next destination will be Endor, where Fett will have no problem capturing him alive. Unfortunately for Fett, it will cost him 300 credits extra in fuel to follow Dengar to Endor. Assuming that Boba Fett cares only about money, what should he do? Should he kill Dengar on Cloud City, or should he travel further and capture Dengar on Endor? Show your work. And no disintegrations.